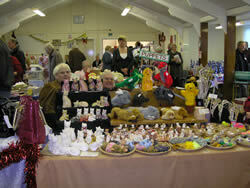 The Victorian Christmas Market for 2008 was held on Sunday 7th December, at the Village Hall. It was a bright and sunny but bitterly cold day, though the weather did not deter people from attending with the stall holders kept busy all day. 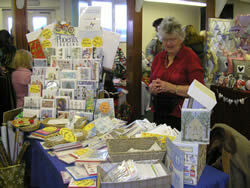 The Hall, annexe and a large marquee were full of different stalls selling many varied and seasonal items and crafts, providing an ideal opportunity to find some unusual Christmas gifts. Many people were dressed in Victorian costume for the occasion. Beautiful handmade jewellery, greeting cards, scarves and toiletries along with preserves, oils, condiments, handbags, Christmas decorations and much more were available. There was also a bottle stall, tombola and raffle, as well as a chance to win a large jar of sweets by guessing the number in the jar, a Christmas cake by guessing its weight and a large cuddly toy by guessing its name. There was also Santa’s Grotto enjoyed by the children. 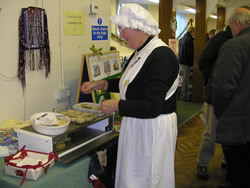 Refreshments included delicious hot pork pies with stuffing and gravy, warm mince pies, tea and coffee. The day was considered a great success and a good time was had by all, with grateful thanks extended to everyone involved. Over £1,700 was raised from the event which will be used to maintain the hall and playing field.